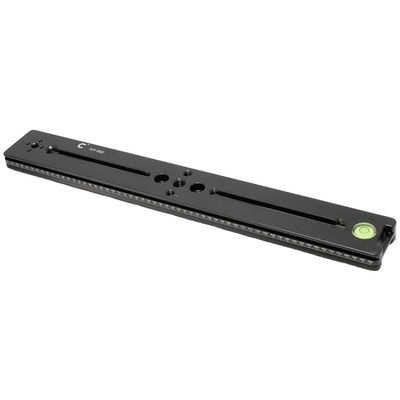 Product #60609 | SKU 5-109 | 0.0 (no ratings yet) Thanks for your rating! The Cinegears 300mm Universal Adjustable Quick-Mount Plate features dual 38mm dovetails, and an array of mounting possibilities. The Cinegears Universal Adjustable Quick-Mount Plate with 38mm Dovetails (11.8") has an array of mounting possibilities. This plate is composed of light weight, aircraft-grade aluminium and is anodise stain-finished to ensure a strong, yet lightweight body with almost no chance of occurrences of abrasion or corrosion. Ensure a level mount with built-in spirit level indicator.